Your best shot for affordable range fun. Highly affordable WPATM Polyformance® Ammo, named for the polymer coating that helps it feed smoothly. It's plenty accurate, and shoots much cleaner than some of the other budget range rounds out there. 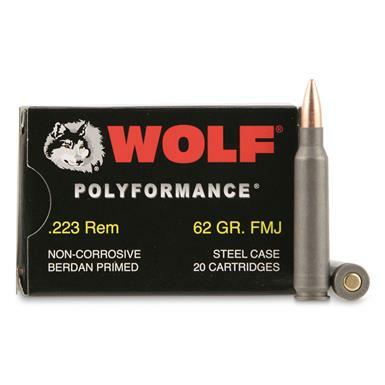 Wolf WPA Polyformance, .223 Remington, FMJ, 62 Grain, 500 Rounds is rated 4.6 out of 5 by 19. Rated 4 out of 5 by Patrick from WPA 223 Good Ammo. Received quickly. Rated 5 out of 5 by Nick from Great Price Worked flawlessly in my AR-15 with the slidefire stock. Rated 5 out of 5 by barbarosa from Superb practice or just plain fun ammo Great ammo at an unbelievable price. My Son in Law has ordered quite a bit of this ammo and it works great in his Windham and in my FN AR M4's and you sure cannot beat the price. On review of a few years back mentioned spraying your steel cased ammo with WD-40. NEVER do this unless you want to render any stored ammo that has been sprayed useless as the WD-40 will get into the powder rendering it useless. This product comes with a "lube" in the form of a polymer coating that makes the round feel "oily" even when it is not. Simply a great product but I have been a big Wolf fan since before the Russians/Ukranians improved the powder mix. ALL Wolf ammo made over the past 7-8 years or so is VASTLY different than the "original" round and the product available today burns about as cleanly as any American made practice round. Great ammo. Now if Sportsmansguide would just make this round available in SP!! Rated 5 out of 5 by Band Aid One from Excellent for the Price No missfires so fire,Accurate,good for targets.woodchuck,crow Blackheaded Buzzards,cyote.and ""Cans""
Rated 5 out of 5 by dortch from great value rounds as described. packaging a-1. will use. Rated 4 out of 5 by irishjack from good practice ammo For the price , this is good practice ammo with reasonable accuracy. Worked fine in my Ruger AR-556.